–Six Flags Magic Mountain, the Thrill Capital of the World, and recently voted by USA TODAY readers as America’s Best Theme Park, has unveiled plans for the highly-anticipated, world-record-breaking hybrid coaster, Twisted Colossus, an unprecedented, awe-inspiring four-minute journey through nearly 5,000 feet of track and two lift hills. Twisted Colossus, the next generation of the beloved wooden roller coaster that thrilled millions of guests in its 36-year reign at the park, will be a unique technological marvel combining an iconic wooden structure with state-of-the-art Iron Horse Track. The advanced technology, available exclusively at Six Flags, provides ride experiences never before possible on wooden coasters, such as over-banked turns and inversions. Twisted Colossus will feature numerous exciting components including a “Top Gun” element, the western hemisphere’s first “High Five” element, and a Zero G Roll. –Six Flags New England, the Thrill Capital of New England, is introducing Wicked Cyclone, a new state-of-the-art roller coaster that integrates the latest in ride technology and innovation. The coaster will offer the ultimate in thrills and adrenaline by combining the extreme characteristics of steel and wood, and be the first hybrid roller coaster to hit the east coast.Wicked Cyclone’s steel track provides riders with a smoother and more thrilling ride along its 3,320 feet of track. The ride stands 10 stories in the sky and reaches speeds of up to 55 mph, providing riders with more airtime than any other coaster in New England. –Six Flags Over Texas, the Thrill Capital of Texas, and Six Flags St. Louis, the Coaster Capital of Missouri – in partnership with Warner Bros. Consumer Products and DC Entertainment – have announced the next generation of interactive thrills with the debut of an all-new 3D interactive dark ride attraction, JUSTICE LEAGUE: BATTLE FOR METROPOLIS. Slated to open at both parks in 2015, guests will become members of the JUSTICE LEAGUE Reserve Team and engage in a full-sensory journey as they battle alongside SUPERMAN, BATMAN, WONDER WOMAN and GREEN LANTERN against Lex Luthor, The Joker and his henchmen. Traveling in six-passenger vehicles, riders must outsmart Lex Luthor and The Joker to save the city of Metropolis. –Six Flags Fiesta Texas has unveiled plans to debut the most exciting coaster in the park’s 22-year history – BATMAN: The Ride. Riders on this 4D Wing Coaster will “face their fear” as they flip head-over-heels at least six times along the weightless, tumbling journey. The ride features a massive, imposing, floating and twisting track frame in which ride vehicles begin their journey by traveling up a 120-foot elevator-type lift before being released for their highly unusual sensory journey…including two beyond-vertical free falls, in addition to the six head-over-heels spins. Not only is BATMAN: The Ride the most exciting thrill ride in Fiesta Texas history, it is currently not available anywhere else on the planet. –Six Flags Great Adventure, the world’s largest theme park, is gearing up for more roller coaster thrills and Halloween scares in 2015. The 510-acre theme park, recently voted America’s second best theme park by USA TODAY readers, debuts the park’s 13th roller coaster Looping Dragon – a pendulum-style thrill ride that offers gut-wrenching loops with maximum “hang” time. The park is also expanding its notoriously scary Fright Fest Halloween festival in 2015 with two new indoor mazes – “Big Top Terror,” a 3-D, black light experience, and “Condemned,” which takes guests inside the walls of a prison. Next door, Hurricane Harbor introduces its first outdoor grill and new, luxury cabanas. –Guests can rocket up seven stories in all directions – forward, backward and upside down – through a bedlam of loops on THE JOKER Chaos Coaster at the Thrill Capital of the South, Six Flags Over Georgia outside of Atlanta. In addition, guests can spin, twist and roll through a cycle of classic fun on Harley Quinn Spinsanity. 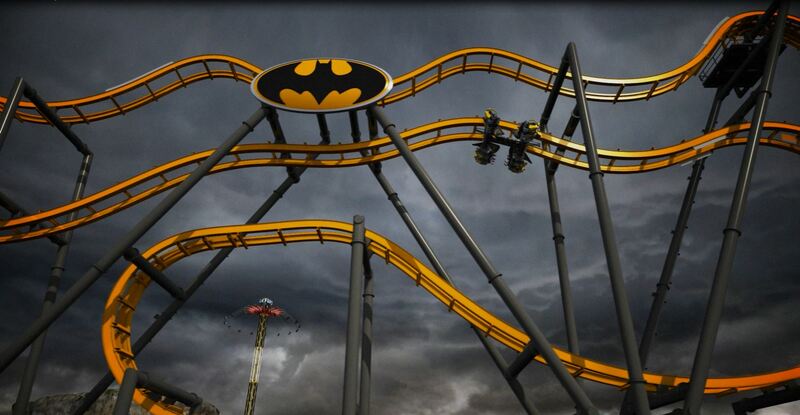 Both new thrilling attractions will transform the park’s iconic Gotham City this coming spring. 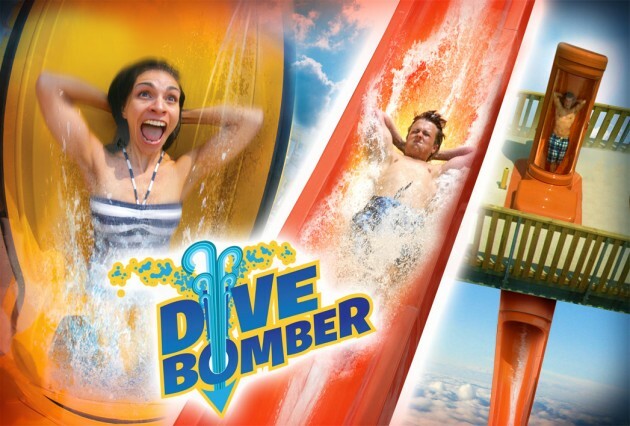 At the South’s Most Thrilling Water Park, Six Flags White Water in Marietta, Georgia, water park daredevils are invited to slip into a clear capsule with a trap door then plummet down more than 100 feet at nearly 90 degrees for a zero-gravity experience on the Dive Bomber water slide. –Six Flags Great America, near Chicago, is proud to announce a celebration of 40 Seasons of Thrills in 2015. From its launch in 1976 to today Six Flags Great America has lead the way in innovation with the addition of world-class coasters, state-of-the-art shows and a massive 20-acre waterpark. Next season Six Flags Great America will upgrade the signature areas of the park, Carousel Plaza and Hometown Square, and re-introduce children’s rides for families to share with the next generation of thrill-seekers. Additionally, Six Flags Great America will host weekly celebrations, in-park festivities and events throughout the summer. –Six Flags Great Escape near Lake George, NY will debut the newly renovated Buccaneer Beach in 2015. The restoration and transformation of a popular children’s area in Splashwater Kingdom makes way for this re-themed pirate adventure featuring children’s slides and interactive water elements offering endless water park fun. The expansion of the water park also includes new pool deck space and increased shaded water park seating. –Bourbon Street Fireball, Six Flags America’s 10th roller coaster, is a chaotic looping coaster with a train that holds 24 riders seated in unique forward and backward, face-to-face positions. The full chaos of the ride is unleashed as the train swings pendulum style to a completely suspended position at the top of the loop, hanging guests momentarily upside down. In full motion, the coaster loops into a series of 360° revolutions of pure adrenaline. Just as the riders think they know what to expect, the train reaches the top of the loop only to reverse direction for additional 360° revolutions. –Six Flags Mexico, the world-class theme park in Latin America, will add the tallest and most exciting spinning attraction in the country. Soaring an astounding 242 feet in the air,SkyScreamer will provide guests breathtaking, panoramic views as they spin high above the park and city below. The journey begins as 32 guests sit two across in open-air swings. At full swing, guests revolve in a 98-foot circle at speeds of 35 mph for a full two minutes. The Six Flags globe at the top of the tower will serve as a new icon drawing guests from near and far. It is time to fly and conquer the sky in the new SkyScreamer. –La Ronde, Quebec’s leading destination for thrills and family entertainment, is turning up the fear factor in 2015 with the addition of an all-new, year-round haunted attraction. Guests will be terrified when walking through Maison Rouge – Labyrinth of Fear, a bone-chilling funhouse that will leave them screaming for their lives. 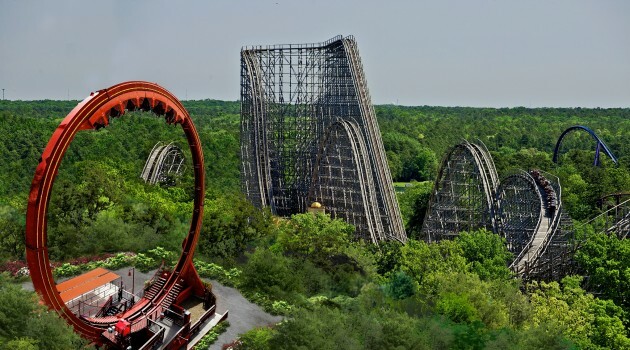 –Dare devils be on alert as Six Flags Discovery Kingdom opens Dare Devil Chaos Coaster in 2015, a single looping coaster that builds anticipation as riders seated back to back travel backward and forward until momentum takes them at top speed revolutions, only to stop upside down at 70 feet high, then reverse direction. It is a thrill ride guaranteed to get their adrenaline pumping. This fall at all Six Flags parks, Fright Fest – the biggest Halloween event in America – keeps getting bigger, better and scarier with more zombies, ghouls and haunted mazes than ever before. Later this year, for the first time ever, Six Flags Magic Mountain and Six Flags Over Georgia join several other Six Flags parks by ringing in the holidays with Holiday in the Park – a winter wonderland featuring all the familiar sights and sounds of the season along with roller coasters, rides and attractions.